"Diets" redirects here. For the sum of food consumed by a person, see Diet (nutrition). For other uses, see Diet. The Low Countries from 1556 to 1648. The Low Countries is the coastal Rhine–Meuse–Scheldt delta region in Western Europe whose definition usually includes the modern countries of Luxembourg, Belgium and the Netherlands. Both Belgium and the Netherlands derived their names from earlier names for the region, due to nether meaning "low" and Belgica being the Latinized name for all the Low Countries, a nomenclature that went obsolete after Belgium's secession in 1830. The Low Countries—and the Netherlands and Belgium—had in their history exceptionally many and widely varying names, resulting in equally varying names in different languages. There is diversity even within languages: the use of one word for the country and another for the adjective form is common. This holds for English, where Dutch is the adjective form for the country "the Netherlands". Moreover, many languages have the same word for both the country of the Netherlands and the region of the Low Countries, e.g., French (les Pays-Bas) and Spanish (los Países Bajos). The complicated nomenclature is a source of confusion for outsiders, and is due to the long history of the language, the culture and the frequent change of economic and military power within the Low Countries over the past 2000 years. In general, the names for the language, for the region, and for the countries within the region, and the adjective forms can all be arranged in five main groups according to their origin: it is a reference to a non-Latin, Germanic language—þiudisk—(Dietsc, "Dutch", Nederduits), whose speakers are ancestral to local Germanic tribes (Belgae, Batavi, Frisii); these tribes dissolved into confederations (Franconian, Frisian) which consolidated into local, economic powerful polities (Flanders, Brabant, Holland) in the low-lying, down river land at the North Sea (Germania Inferior, Lower Lorraine, Low Countries, Netherlands). The historic Low Countries made up much of Frisia, home to the Frisii, and the Roman provinces of Gallia Belgica and Germania Inferior, home to the Belgae and Germanic peoples like the Batavi. Throughout the centuries, the names of these ancestors have been in use as a reference to the Low Countries, in an attempt to define a collective identity. But it was in the fourth and fifth centuries that a Frankish confederation of Germanic tribes significantly made a lasting change by entering the Roman provinces and starting to build the Carolingian Empire, of which the Low Countries formed a core part. By the eighth century, most of the Franks had exchanged their Germanic Franconian languages for the Latin-derived Romances of Gaul. However, the Franks that stayed in the Low Countries had kept their original language, i.e., Old Dutch, also known as "Old Low Franconian" among linguists. At the time the language was spoken, it was known as *þiudisk, meaning "of the people"—as opposed to the Latin language "of the clergy"—which is the source of the English word Dutch. Now an international exception, it used to have in the Dutch language itself a cognate with the same meaning, i.e., Diets(c) or Duuts(c). The designation "low" to refer to the region has also been in use many times. First by the Romans, who called it Germania "Inferior". After the Frankish empire was divided several times, most of it became the Duchy of Lower Lorraine in the tenth century, where the Low Countries politically have their origin. Lower Lorraine disintegrated into a number of duchies, counties and bishoprics. Some of these became so powerful, that their names were used as a pars pro toto for the Low Countries, i.e., Flanders, Holland and to a lesser extent Brabant. Burgundian, and later Habsburg rulers added one by one the Low Countries' polities in a single territory, and it was at their francophone courts that the term les pays de par deçà arose, that would develop in Les Pays-Bas or in English "Low Countries" or "Netherlands". A Dutch-German dictionary. The languages are in Dutch indicated as Nederduitsch ("Dutch") and Hoogduitsch ("German"), while in German as Holländisch and Deutsch respectively (1759). English is the only language to use the adjective Dutch for the language of the Netherlands and Flanders or something else from the Netherlands. The word is derived from Proto-Germanic *þiudiskaz. The stem of this word, *þeudō, meant "people" in Proto-Germanic, and *-iskaz was an adjective-forming suffix, of which -ish is the Modern English form. Theodiscus was its Latinised form and used as an adjective referring to the Germanic vernaculars of the Early Middle Ages. In this sense, it meant "the language of the common people", that is, the native Germanic language. The term was used as opposed to Latin, the non-native language of writing and the Catholic Church. It was first recorded in 786, when the Bishop of Ostia writes to Pope Adrian I about a synod taking place in Corbridge, England, where the decisions are being written down "tam Latine quam theodisce" meaning "in Latin as well as Germanic". So in this sense theodiscus was referred to the Germanic language spoken in Great Britain, that was later replaced by the name Englisc. During the Middle Ages the Old English variant þeodisc was subsequently influenced from Middle Dutch duutsc/duitsc/dietsc, and was then mainly used to refer to the inhabitants of the Low Countries, with whom there was extensive trade. Though initially also encompassing a broader definition signifying "speakers of Germanic languages on the continent" or "Non-Romance speakers" the use of the word Dutch in this sense was rare and would become obsolete following the growing and intensive rivalry between England and the Dutch Republic during the 17th century. An exception are the Pennsylvania Dutch, who were originally German immigrants, speak a German dialect and refer to themselves as Pennsilfaanisch Deitsch. In the Dutch language itself, Diets(c) (later Duyts and Duits) was used as one of several autonyms until the 18th century, when it became obsolete and Duits became the sole Dutch exonym for German. From the second half of the 16th until the middle of the 18th century, Nederduits appears as the nomenclature for the Dutch language among both scholars and writers of literature. Not only because it was perceived as modern, but also because nederig is Dutch for "humble", thus invoking the sense of a humble language, forming a wordplay, which appealed to the highly religious Dutch people of the time and the low lying features of their country. However, the early 19th century, saw the emergence of modern Germanic linguistics, and German linguists used the term Niederdeutsch for the German varieties spoken in the North of Germany which did not experience the High German consonant shift. Dutch linguists subsequently calqued the terminology, and used Nederduits as its translation for these German dialects. As a result, Nederduits started to have two meanings. To avoid this confusion Nederlands as a reference to the Dutch language prevailed over Nederduits. The Nederduits Hervormde Kerk in Nederland changed in the 19th century its name in Nederlands Hervormde Kerk, however in South Africa, offshoots of this church kept their old name in the Dutch-related Afrikaans. Thus the Nederduitsch Hervormde Kerk van Afrika is translated in English as "Dutch Reformed Church in South Africa (NHK)" and the Nederduitse Gereformeerde Kerk as "Dutch Reformed Church in South Africa (NGK)". Germania inferior: Roman province established in 89 AC (parts of Belgium and the Netherlands), downstream from Germania Superior (southern Germany). In the 16th century it was reused without the deictic context. Niderlant: Since the 12th century, Niderlant ("Low land") was mentioned in the Nibelungenlied as the region between the Meuse and the lower Rhine. In this deictic context the higher ground began approximately at upstream Cologne. Les pays de par deçà: used by 15th century Burgundian rulers who resided in the Low Countries, meaning "the lands over here". On the other hand, Les pays de par delà or "the lands over there" was used for their original homeland Burgundy (central France). Pays d'embas: used by 16th century Habsburg ruler Mary, Queen of Hungary, meaning "land down here", used as apposed to her other possessions on higher grounds in Europe (Austria and Hungary). Possibly developed from "Les pays de par deçà". 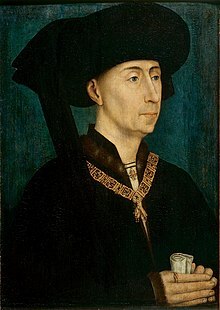 Under Philip the Good (1396–1467), Duke of Burgundy, the provinces of the Netherlands began to grow together: Flanders, Artois, Namur, Holland, Zeeland, Hainaut, Brabant, Limburg and Luxembourg were ruled in personal union. He has been honored by later humanists as the founding father of the Netherlands. By Early Netherlandish painter Rogier van der Weyden, circa 1450). Pays d'embas and later Les Pays-Bas was translated as Neder-landen in contemporary Dutch official documents. From the mid-sixteenth century on, this became a commonly used name and lost its deictic meaning of a low-lying land as opposed to a high-lying land. But the Eighty Years' War (1568–1648) divided the Low Countries into the northern Dutch Republic (Latin: Belgica Foederata) and the southern Spanish Netherlands (Latin: Belgica Regia), introducing a new deixis, i.e. Northern vs. Southern Netherlands, the latter being roughly present-day Belgium. Nederlands, as a name for the language, was first attested in a work printed at Gouda in 1482. Since the 15th century it slowly replaced the Dutch autonym Diets and Duyts. The English adjective "Netherlandish", meaning "from the Low Countries", derived directly from the Dutch adjective Nederlands. It is typically used in reference to paintings or music produced anywhere in the Low Countries during the 15th and early 16th century, which are collectively called Early Netherlandish painting (Dutch: Vlaamse primitieven, "Flemish primitives" — also common in English before the mid 20th century), or (regarding music) the Netherlandish School. Later art and artists from the southern Catholic provinces of the Low Countries are usually called Flemish and those from the northern Protestant provinces Dutch, but art historians sometimes use "Netherlandish art" for art of the Low Countries produced before 1830, i.e., until the secession of Belgium from the Netherlands. The Low Countries (Dutch: Lage Landen) refers to the historical region de Nederlanden: those principalities located on and near the mostly low-lying land around the Rhine–Meuse–Scheldt delta. That region corresponds to all of the Netherlands, Belgium and Luxembourg, forming the Benelux. The name "Benelux" is formed from joining the first two or three letters of each country's name Belgium, Netherlands and Luxembourg. It was first used to name the customs agreement that initiated the union (signed in 1944) and is now used more generally to refer to the geopolitical and economical grouping of the three countries, while "Low Countries" is used in a more cultural or historical context. The name of the historic County of Flanders had been a pars pro toto for the Low Countries until the 17th century. Flemish (Dutch: Vlaams) is derived from the name of the County of Flanders (Dutch: Graafschap Vlaanderen), in the early Middle Ages the most influential county in the Low Countries, and the residence of the Burgundian dukes. Due to its cultural importance, "Flemish" became in certain languages a pars pro toto for the Low Countries and the Dutch language. This was certainly the case in France, since the Flemish are the first Dutch speaking people for them to encounter. In French-Dutch dictionaries of the 16th century, "Dutch" is almost always translated as Flameng. A calque of Vlaams as a reference to the language of the Low Countries was also in use in Spain. In the 16th century, when Spain inherited the Habsburg Netherlands, the whole area of the Low Countries was indicated as Flandes, and the inhabitants of Flandes were called Flamencos. For example, the Eighty Years' War between the rebellious Dutch Republic and the Spanish Empire was called Las guerras de Flandes and the Spanish army that was based in the Low Countries was named the Army of Flanders (Spanish: Ejército de Flandes). The name of the historic County of Holland is currently used as a pars pro toto for the Netherlands. In many languages including English, (a calque of) "Holland" is a common name for the Netherlands as a whole. Even the Dutch use this sometimes. Strictly speaking, Holland is only the central-western region of the country comprising two of the twelve provinces, North Holland and South Holland, and thus linguistically a pars pro toto similar to use of Russia for the (former) Soviet Union, and England for the United Kingdom. The use is sometimes discouraged. For example, the "Holland" entry in the style guide of The Guardian and The Observer newspapers states: "Do not use when you mean the Netherlands (of which it is a region), with the exception of the Dutch football team, which is conventionally known as Holland". From the 17th century onwards, the County of Holland was the most powerful region in the current Netherlands. The counts of Holland were also counts of Hainaut, Friesland and Zeeland from the 13th to the 15th centuries. Holland remained most powerful during the period of the Dutch Republic, dominating foreign trade, and hence most of the Dutch traders encountered by foreigners were from Holland, which explains why the Netherlands is often called Holland overseas. After the demise of the Dutch Republic under Napoleon, that country became known as the Kingdom of Holland (1806–1810), and the former countship of Holland was split up and became two of its eleven provinces, later known as North Holland and South Holland, because one Holland province by itself was considered too dominant in area, population and wealth compared to the other provinces. Today the two provinces making up Holland, including the cities of Amsterdam, The Hague and Rotterdam, remain politically, economically and demographically dominant – 37% of the Dutch population live there. In most other Dutch provinces and also Flanders, the word Hollander is sometimes used in a pejorative sense to refer to the perceived superiority or supposed arrogance of people from the Randstad – the main conurbation of Holland proper and of the Netherlands. Duchy of Brabant located in the heart of the old Lower Lorraine. Belgian patriots chose the colours of Brabant (red, yellow and black) for their cockade. This would later influence the Belgian flag created in 1830. As the Low Country's prime duchy, with the only and oldest scientific centre (the University of Leuven), Brabant has served as a pars pro toto for the whole of the Low Countries, for example in the writings of Desiderius Erasmus in the early 16th century. Perhaps of influence for this pars pro toto usage is the Brabantian holding of the ducal title of Lower Lorraine. In 1190, after the death of Godfrey III, Henry I became Duke of Lower Lorraine, where the Low Countries have their political origin. However, by that time the title had lost most of its territorial authority. According to protocol, all his successors were thereafter called Dukes of Brabant and Lower Lorraine (often called Duke of Lothier). Brabant symbolism served again a role as national symbols during the formation Belgium. The national anthem of Belgium is called the Brabançonne (English: "the Brabantian"), and the Belgium flag has taken its colors from the Brabant coat of arms: black, yellow and red. This was influenced by the Brabant Revolution (French: Révolution brabançonne, Dutch: Brabantse Omwenteling), sometimes referred to as the "Belgian Revolution of 1789–90" in older writing, that was an armed insurrection that occurred in the Austrian Netherlands (modern-day Belgium) between October 1789 and December 1790. The revolution led to the brief overthrow of Habsburg rule and the proclamation of a short-lived polity, the United Belgian States. Some historians have seen it as a key moment in the formation of a Belgian nation-state, and an influence on the Belgian Revolution of 1830. Holland, Flanders and 15 other counties, duchies and bishoprics in the Low Countries were united as the Seventeen Provinces in a personal union during the 16th century, covered by the Pragmatic Sanction of 1549 of Holy Roman Emperor Charles V, which freed the provinces from their archaic feudal obligations. The Latin title Index Batavicus is translated in the subtitle (not shown) as Naamrol van de Batavise en Hollandse schrijvers ("Index of Batavian and Dutch writers"). The Dutch Virgin sits on the Dutch lion. Left in the background a bookcase bearing the coats of arms of the Dutch Republic (1701). Throughout the centuries the Dutch attempted to define their collective identity by looking at their ancestors, the Batavi. As claimed by the Roman historian Tacitus, the Batavi where a brave Germanic tribe living in the Netherlands, probably in the Betuwe region. In Dutch, the adjective Bataafs ("Batavian") was used from the 15th to the 18th century, meaning "of, or relating to the Netherlands" (but not the southern Netherlands). Frankish was the West Germanic language spoken by the Franks between the 4th and 8th century. Between the fifth and ninth centuries, the languages spoken by the Salian Franks in Belgium and the Netherlands evolved into Old Dutch (Dutch: Oudnederfrankisch), which formed the beginning of a separate Dutch language and is synonymous with Old Dutch. Compare the near-synonymous usage, in a linguistic context, of Old English versus Anglo-Saxon. Frisii were an ancient tribe who lived in the coastal area of the Netherlands in Roman times. They left the land abandoned due to deteriorating climate conditions. Anglo-Saxons, coming from the east, repopulated the region. Franks in the south, who were familiar with Roman texts, called the coastal region Frisia, and hence its inhabitants "Frisians", even though they had no ancestry with the old Frisii. After a Frisian Kingdom emerged in the mid-7th century in the Netherlands, with its center of power the city of Utrecht, the Franks conquered the Frisians and converted them to Christianity. From that time on a colony of Frisians was living in Rome and thus the old name for the people from the Low Countries who came to Rome has remained in use in the national church of the Netherlands in Rome, which is called the Frisian church (Dutch: Friezenkerk; Italian: chiesa nazionale dei Frisoni). In 1989, this church was granted to the Dutch community in Rome. ^ "Low Countries - definition of Low Countries by the Free Online Dictionary, Thesaurus and Encyclopedia". Farlex, Inc. Retrieved 26 January 2014. ^ derived from the ancient Belgae confederation of tribes. ^ "Lotharingia / Lorraine ( Lothringen )". 5 September 2013. Retrieved 1 February 2014. ^ "1. De landen van herwaarts over". Vre.leidenuniv.nl. Retrieved 1 January 2014. ^ Alastair Duke. "The Elusive Netherlands. The question of national identity in the Early Modern Low Countries on the Eve of the Revolt". Retrieved 1 January 2014. ^ Mallory, J. P.; Adams, D. Q. (2006), The Oxford Introduction to Proto-Indo-European and the Proto-Indo-European World, USA: Oxford University Press, ISBN 0-19-929668-5 , p. 269. ^ Random House Webster's Unabridged Dictionary, 2nd revised edn., s.v. "Dutch" (Random House Reference, 2005). ^ Walahfrid Strabo's Libellus de Exordiis Et Incrementis Quarundam in ... a translation by Alice L. Harting-Correa. ^ Roland Willemyns (2013). Dutch: Biography of a Language. Oxford University Press. p. 5. ^ American FactFinder, United States Census Bureau. "American Community Survey 3-Year Estimates". Factfinder.census.gov. Retrieved 31 July 2010. ^ The Pennsylvania Dutch Country, by I. Richman, 2004: "Taking the name Pennsylvania Dutch from a corruption of their own word for themselves, "Deutsch," the first German settlers arrived in Pennsylvania in 1683. By the time of the American Revolution, their influence was such that Benjamin Franklin, among others, worried that German would become the commonwealth's official language." ^ Frans, Claes (1970). "De benaming van onze taal in woordenboeken en andere vertaalwerken uit de zestiende eeuw". Tijdschrift voor Nederlandse Taal- en Letterkunde (86): 300. ^ Bree, Marijke van der Wal, Cor van (2008). Geschiedenis van het Nederlands (5., bijgewerkte druk. ed.). Houten: Spectrum. ISBN 90-491-0011-2. ^ Toorn, M.C. van den (1980). Nederlandse taalkunde (6. verbeterde druk. ed.). Utrecht: Spectrum. ISBN 978-90-274-5245-0. ^ As based on WNT, Dictionary of the Dutch language, entry Nederduits. ^ Peters, Wim Blockmans and Walter Prevenier ; translated by Elizabeth Fackelman ; translation revised and edited by Edward (1999). The promised lands the Low Countries under Burgundian rule, 1369–1530. Philadelphia: University of Pennsylvania Press. p. 85. ISBN 0-8122-0070-5. ^ "The New Cambridge Modern History: Volume 2, The Reformation, 1520–1559". ^ Frans, Claes (1970). "De benaming van onze taal in woordenboeken en andere vertaalwerken uit de zestiende eeuw". Tijdschrift voor Nederlandse Taal- en Letterkunde (86): 297. ^ Pérez, Yolanda Robríguez (2008). The Dutch Revolt through Spanish eyes : self and other in historical and literary texts of Golden Age Spain (c. 1548–1673) (Transl. and rev. ed.). Oxford: Peter Lang. p. 18. ISBN 3-03911-136-1. Retrieved 5 April 2016. ^ "MED, entry "Flēming"". Quod.lib.umich.edu. Retrieved 17 October 2013. ^ "Guardian and Observer style guide: H". The Guardian. London. 19 December 2008. Retrieved 1 July 2010. ^ "Holland or the Netherlands?". The Hague: Ministry of Foreign Affairs. Archived from the original on 11 July 2010. Retrieved 2 July 2010. ^ Prevenier, W.; Uytven, R. van; Poelhekke, J. J.; Bruijn, J. R.; Boogman, J. C.; Bornewasser, J. A.; Hegeman, J. G.; Carter, Alice C.; Blockmans, W.; Brulez, W.; Eenoo, R. van. Acta Historiae Neerlandicae: Studies on the History of The Netherlands VII. Springer Science & Business Media. pp. 83–87. ISBN 978-94-011-5948-7. ^ a b Frans, Claes (1970). "De benaming van onze taal in woordenboeken en andere vertaalwerken uit de zestiende eeuw". Tijdschrift voor Nederlandse Taal- en Letterkunde (86): 296. ^ "Le Dictionnaire - Définition batavisme et traduction". www.le-dictionnaire.com. ^ "Le Dictionnaire - Définition batave et traduction". www.le-dictionnaire.com. ^ Dijkstra, Menno (2011). Rondom de mondingen van Rijn & Maas. Landschap en bewoning tussen de 3e en 9e eeuw in Zuid-Holland, in het bijzonder de Oude Rijnstreek (in Dutch). Leiden: Sidestone Press. p. 386. ISBN 978-90-8890-078-5. Origin and History of the term "Dutch"
This page was last edited on 1 April 2019, at 23:42 (UTC).